As a designer, there is nothing more satisfying than hearing that your jewellery designs are not only enjoyed, but also have an emotional connection with their wearer. 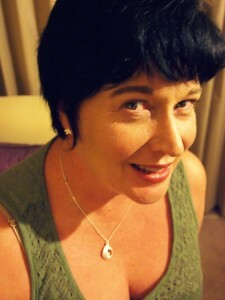 Recently I was told a lovely story by Julia who was wanted to buy some One Day Soone jewellery for her daughter Maddie. Knowing that if she chose the jewellery by herself it would not necessarily suit Maddies’ taste. On a recent visit home, Maddie and Julia shared some precious mother and daughter time, chatting and browsing the One Day Soone website to choose Maddies’ new ‘Branching Out’ bracelet from the Enchanted Forest collection. In the meantime Julia also fell in love with the Hopes&Dreams collection ‘Round domed’ pendant and ‘Three leaf’ stud earrings! This weeks ‘Inspiring people, inspiring stories’ blog features Julia, a fantastically energetic soul with a clear vision of her dreams, and see her wearing her favourite One Day Soone pendant…..
What is your favourite One Day Soone design? Have to say I have two favorite pieces which I wear both together or apart, and I just can’t choose between them. The Round Dome Pendant is beautiful and sits nicely on me. I love the way the glimpse of gold peaks out, I love interesting pieces. My stud three leaf earrings are divine. They go with any look, and mix with so many other pieces of my jewellery. Studs can look insignificant on me with my strong coloring, not my leaves though! What is your ‘One Day Soone’ dream? Hmmm, this is a tricky one. Can I be greedy and have two? Of course I can reach for two dreams! It’s great being a woman. I’m a people person. I love people, reaching out to them, helping them, laughing with them and seeing others achieve. I’m looking close to home with this dream, and hoping to help my two University children reach their career dreams. I want to cheer them on when they graduate and receive their degrees, and I want to celebrate their job success with them. Now for my dream just for me. It has to involve food and achieve producing good food right from the start to the finish. I want to plant, grow and cook with my herbs. What steps have you and are you taking to achieve your ‘One Day Soone’ dream? For me to see my children as graduates and independent adults I have to support them on many levels. This means good communication (not always easy as a parent living away from them), good advice (yes whether you want it or not!) and involving them in any way I can with my life. They need to feel emotionally supported and understand what is possible for them if they plan and work toward their own goals. I think most parents walk a fine line between interfering and being supportive, we can only keep trying, and I think most of us do it pretty well. As for my dream herb garden, well our next home is undecided at present, so I’m just thinking what is possible with my options: garden box on a balcony or hydroponics in the kitchen, possibly a garden bed in the back yard. Lets see where the wind takes me with this one! Who is your role model for your ‘One Day Soone’ dream? Interestingly I have three role models and they are all older women. The first is my husbands Aunt. She has enjoyed a happy 50 year marriage, raised 5 wonderful children, and traveled the world on one (very average) income. She has never had paid work, but done volunteer and charity work all her married life. This lady is not rich, just cleaver. My second lady has again worked all her life with special needs children whilst supporting her husband running a business, raised a daughter and overcome insurmountable hardships both personally and financially. Her favorite quote is ” You have to push your own wheelbarrow in this life, no one is going to do it for you”. So she did, and today has her own home and a darling grand daughter to boot. My beautiful friend has been married 60 years. The last of my three wonderful mentors has taught me what it is to be a positive parent and wife and still enjoy a life for yourself. She also has managed family as an expat and rallied in crises. This lady can just make you feel good by walking in the room and smiling. What do my mentors share? I would have to say strength, support for others, strong family commitments and values and good self esteem. They have all handled life’s toughest situations and survived, and managed to enjoy the life they have no matter what their lot.